This article first appeared in The Edge Malaysia Weekly, on July 23, 2018 - July 29, 2018. BACK in 2013, GUH Holdings Bhd had a happy problem. It was sitting on a big cash pile and needed to figure out what to do with it. With a net cash position of more than RM180 million, the company faced the dilemma of choosing between business expansion, paying higher dividends and not doing anything. Eventually, it decided to venture into new businesses, and that is where the money has been going in the last few years. In 2014, GUH acquired a 46-acre tract in Simpang Ampat, Penang, for RM70 million, and a year later, it bought a total of 12 acres in Sungai Bakap for RM22 million. Then in 2016, the group ventured into the education sector by acquiring 25% equity interest in international school operator Straits International Education Group Sdn Bhd (SIEG) for RM11 million. GUH also bought three acres in Rawang, Selangor, for RM6.5 million, where it put up buildings for an international school at a cost of RM33 million. The land and buildings will be leased out to SIEG, whose Rawang school will record its first student intake come this September. It is notable that GUH also invested RM13.6 million in the water industry by acquiring Teknoserv Engineering Sdn Bhd in 2012/13. GUH saw its net cash pile shrink from RM136 million as at Dec 31, 2015, to RM46.6 million as at March 31 this year. The company, which used to have a debt-free balance sheet, saw its gross borrowings swell to RM55.6 million. Moreover, in the financial year ended Dec 31, 2017 (FY2017), GUH slipped into the red for the first time since FY2005. The group reported a net loss of RM1.7 million in FY2017 and RM1.5 million in the first quarter ended March 31, 2018 (1QFY2018). The weaker financial performance was due mainly to its water and wastewater treatment division, which posted a loss before tax of RM6.5 million in FY2017. CEO and managing director Datuk Kenneth H’ng Bak Tee concedes that the group is still on a learning curve in the water industry. And it is paying the price for it. “When we first ventured into the water business, we just tapped the existing expertise of Teknoserv Engineering. But we realised that we needed to have a lot of expertise and experience to execute water projects correctly,” he tells The Edge in an interview. Currently, Teknoserv Engineering has seven ongoing engineering, procurement and construction (EPC) jobs that consist of two water treatment plant projects, four sewerage-related projects as well as one industrial wastewater upgrading project. Its direct and indirect clients include PBA Holdings Bhd, Pengurusan Aset Air Bhd, Syarikat Pengeluaran Air Sungai Selangor Sdn Bhd, Syarikat Air Melaka Bhd and Lembaga Air Perak. Teknoserv Engineering had an order book of RM134 million as at December 2017 but H’ng acknowledges that the company could hardly make any profits, thanks to escalating costs. “Our cost is too high and our bidding price was too low. For these seven projects, the best we could do was to break even. But in the future, we will definitely bid higher,” he says. While GUH’s venture into the water business has yet to bear fruit, H’ng has already planned to take it to the next level — by actively looking for investment opportunities in water and sewerage concessions or build-operate-transfer (BOT) projects. “At the moment, we only do EPC, which is just a contractor trying to get jobs. But our ultimate aim is to get bigger projects. We are working hard to get our first concession or BOT project within a year or two, to at least cushion our existing EPC projects,” he says, adding that GUH is now more confident as it has learnt its lesson and recruited more senior technical experts. There will always be demand for water and sewerage treatment business in developing countries such as Indonesia, Vietnam, Cambodia, Myanmar and Laos. “We are exploring water concessions in these countries. With that coming in, this division should break even in FY2018. But don’t expect substantial profits yet because there is nothing much to shout about now,” H’ng explains. The 58-year-old was appointed to the GUH board in September 2004. He is the brother of the group’s executive chairman Tan Sri H’ng Bok San and non-executive director Datuk Harry H’ng Bak Seah. His niece, Jessica H’ng Hsieh Ling, is also a non-executive director of GUH. Collectively, the H’ng family owned at least 19% of the company as at March 30. Not many may be aware of GUH’s interesting history. In 1994, the H’ng family acquired, via a reverse takeover, property company Grand United Holdings Bhd, which was then controlled by former MCA president Tan Sri Tan Koon Swan. The family’s printed circuit board (PCB) manufacturing business, whose factories were in Penang and Suzhou, China, was injected into Grand United Holdings before the company was renamed GUH in 2005. PCBs are found in numerous items, including air-conditioning units, toys, home appliances, amplifiers, audio/visual products and projectors. GUH’s major clients in this business are Japanese and South Korean firms such as Sony, Sharp, Panasonic, Yamaha and Pioneer. PCB manufacturing remains GUH’s bread and butter, contributing 80.1% to its revenue in FY2017. The water division and property development contributed 11.6% and 5.4% respectively. Due to its Grand United Holdings legacy, GUH has been developing the 500-acre township, Taman Bukit Kepayang, in Seremban, Negeri Sembilan. Today, there are still about 120 acres to 140 acres that have yet to be developed. “In the 1980s, the company belonged to Tan Koon Swan and it got into financial difficulties. That was when we came in and talked to him; he was happy to discuss and sell the company to us. When we bought him out, the acquisition included Taman Bukit Kepayang,” H’ng explains. GUH also has a master plan for its land bank in Simpang Ampat but H’ng declines to reveal the gross development value of the project. “It is a five-year, mixed-use development that consists of commercial and residential components, a school, hospital, police station and shopping mall. We plan to launch the first phase — the residential component — in the second half of next year,” he says. Moving forward, H’ng sees the likelihood of GUH returning to the black in FY2018. “To me, the only concern is the utilities division. I am quite happy with the progress of our property division; property sales in Taman Bukit Kepayang are very good,” he comments. 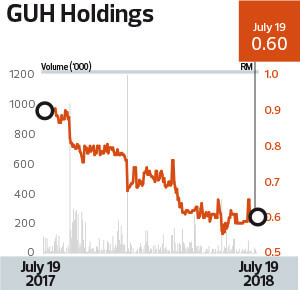 GUH’s share price had declined 14% year to date to 60 sen last Thursday, giving it a market capitalisation of RM164.6 million. The stock is trading at a price-book value of 0.32 times. H’ng believes that the current share price does not reflect the actual value of the company. “It is backed by strong assets, so I think our shares are definitely undervalued. Once we turn around, I am sure our shares will perform better. At the moment, most investors think our fundamentals are not there yet,” he says. On hindsight, the minority shareholders may wish that the management had distributed the large cash pile rather than splashing it on business ventures and expansion. Indeed, the company cut and then eliminated dividends during the slump in its financial performance. It paid a lower dividend per share of four sen in FY2016, compared with five sen in FY2015, before it stopped paying any in FY2017. Still, H’ng thinks the company should conserve cash to execute the plans in the pipeline for future growth.